SPECIAL REPORT – AGE-CHEATING IN THE NIGERIA U-20 NATIONAL FOOTBALL TEAM? According to the CAF-regulations, only players born on or after 01.01.1991 are eligible to play. I have strong reason to believe that several players in the Nigeria squad are older, which I will focus on in this post and try to document / make probable. Gideon Gambo is the reserve goalkeeper at Sharks FC. Okiemute Odah (born 23.11.1988) is an established first choice and Gambo has not played many matches in the Nigeria Premier League. The date of birth of Gambo is unknown to me but I have no reason to believe that Gambo is born earlier than 01.01.1991. Ojobo is a right-back / left-back who joined Enyimba FC from Bayelsa United FC before the current campaign. Mackson Ojobo is also known as “Markson Ojobo”. I was very surprised to read about Ojobo’s inclusion in the squad as Ojobo is a quite experienced player in the Nigeria Premier League. 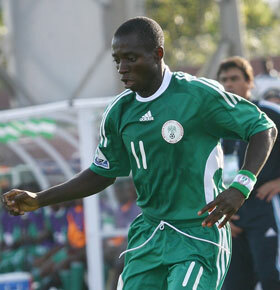 Ojobo is a former player of Ocean Boys FC and was part of the team that won the Nigeria Premier League 2006. The Nigeria Premier League 2006 was played between 15.04.2006 and 27.08.2006. Ojobo also won the Nigeria Premier League in 2008-2009 with Bayelsa United FC. I personally find it rather hard to believe that Ojobo is born on or after 01.01.1991. This would have made his 14 or 15 years old when he won the Nigeria Premier League 2006 with Ocean Boys FC. It is very rare that such young players compete in the tough Nigerian football. Arokoyo is a talented central defender, presented in my post from 27.02.2011. I believe that Arokoyo is born in 1992 or 1993 and I am sure that he will have a brilliant tournament in South Africa. Anyanwu is a regular central defender at Enyimba FC. He made his full international debut for Nigeria on 11.08.2010 against South Korea. I have no information about the age of Anyanwu but he has not been around that long and I believe that he is born on or after 01.01.1991. Osuchukwu plays as an attacking midfielder at Dolphins FC. He was presented in my post from 20.02.2011. Unfortunately, the official homepage of Gateway FC is now deleted and I cannot document the date of birth 16.02.1990. However, I strongly believe that this is the correct birthdate of the player. Daniel is a defensive midfielder at Kwara United FC. He was one of the revelations of the 2009-2010 season according to SuperSport and has also been in fine form this season. Based on the above, I cannot possibly believe that Philemon Daniel is born on or after 01.01.1991. It does not seem likely at all that a 12 year old plays in the Nigeria Premier League in 2005. Ajagun is a brilliant attacker / winger at Dolphins FC and a former star of the Nigeria U-17 national football team. Ajagun is born 10.02.1993 and should become a key performer in the tournament. The date of birth is FIFA-confirmed and should be correct. Nwofor is the star striker at Enugu Rangers FC. Nwofor, sometimes referred to as Nwafor, is a powerfully-built forward with three league goals to his name in the 2010-2011 season. Based on this information I find it hard to believe that Nwofor is born on or after 01.01.1991. Envoh is a tricky attacker / winger at Sharks FC, born 12.12.1992. Envoh has not scored yet this season, despite being a regular player at Sharks. The date of birth is FIFA-confirmed and should be correct. The picture is of Terry Envoh and is taken from MTN Football. Onduku is a winger playing for Sharks FC, known for his dazzling runs down the flanks. Onduku was presented in my post from 19.03.2011. Unfortunately, I find it hard to believe that Onduku is born on or after 01.01.1991. Based on the above, I fear that the Nigeria U-20 national football team could get into problems for age-cheating. It seems unlikely that Mackson Ojobo, Chidi Osuchukwu, Philemon Daniel, Uche Nwofor and Gomo Onduku are born on or after 01.01.1991. I personally have a strong problem with age-cheating as it is highly unfair to struggling players who are honest about their age. Football is often a way out of poverty and it is not fair that a player who is 25 years old should take the place of a promising 18 year old player for such an event as the Orange African Youth Championship in South Africa. Could you please send me the document about the age of Uche Nwofor. Ik can’t read it from your blog. Thank you. Nigerians, when are we going 2 stop cheating. are you advising or directing? why not ask 4 the inclusion of your players that were dropped, rather than digging into issues that you do not have basic facts of. i believe your write up is baseless and sentimental. pls allow the team to concentrate.